There’s a good chance that I’m just a sucker for romance. Somewhere in the middle of The Sun is Also a Star the lead characters Daniel and Natasha stand facing each other on the streets of New York City. They lean in, their heads touching. Daniel’s long hair falls forward forming a curtain around their faces shielding them from the city. I fell in love in a little bit. 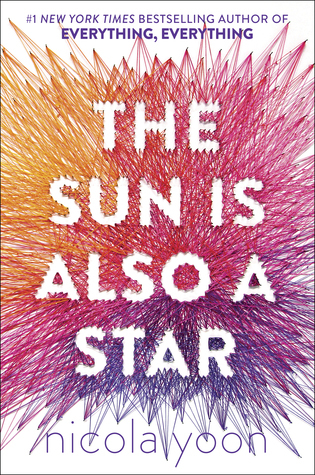 The Sun Is Also A Star is something of an IT book among YA readers this year, but for those of you who may not have heard of it…. Natasha is a high school senior hoping to become a data scientist. Through no fault of her own, she is about to be deported to her native Jamaica. Daniel is a Korean American high school senior facing an entrance interview for Yale where he hopes to be pre-med. Again, through no fault of his own. The two meet through a series of chance events,–she on her way to an immigration lawyer; he on his was to the interview both of which are taking place in the same building. They end up spending the day together, falling in love, hoping to have found something that will last a lifetime against all the odds. This may seem like an outrageous coincidence but anyone who has ever lived in a big city can tell you they are really small towns. Eventually you end up in a circle of people who all know each other through friends of friends. There are so many things I loved about The Sun is Also a Star, this play with coincidence and the train of events was just one. I loved both characters. They bring a point of view I have not encountered before, which has become something I value very highly in my reading these days. Both are from troubled but intact families. Both are successful, basically good people. Some might argue that they are wish-fulfillment on the part of the author, but I didn’t mind. They were a wish I enjoyed having fulfilled. What I probably liked most about the book was the way the alternating narrative, Daniel speaks, then Natasha speaks, was broken by the voices of the people they met along the way and by the occasional bit of background information. Natasha is late to her appointment with an immigration official who refuses to see her as a result because the woman at the security screening station takes too long with her bags. Afterwards, this woman is given three pages to tell her story, what was going on in her own life that led her to take so long. We are all players in each other’s drama, we just don’t see the full impact of our roles. None of this is original, I know. The mismatched lovers who spend one day together goes back at least to Audrey Hepburn and Gregory Peck in Roman Holiday. (A movie you must see before you die by the way. Trust me.) The alternating narrative structure is as old as Charles Dickens at least. The digressions into the lives of minor characters along the way is not new either. That bit about the hair forming a curtain was new to me, but the moment on the rooftop looking out at the city, seeing each other through the crowded streets, being a witness to a humiliating moment with parents, rushing after someone leaving a subway car. Cliche, cliche, cliche. But sometimes the cliches align themselves in just the right way, and it all works. You can call me a sucker but it all worked for me with The Sun is Also a Star. you convinced me! I’ll let you know what I think. It reminded me of Baldwin’s If Beale Street Could Talk kind of. Maybe just because that’s the other “most romantic book” I could think of. This book sounds really fun. I don’t think I have ever read a book about a chnace one day romance, so I will definitely pick this up. I loved her debut book Everything, Everything. Thanks for the review! I may look for Everything, EVerything. I’ve not been reading much YA fiction lately, but that could change. Totally loved this one as well! Next Next post: Top Ten Favorite Reads for 2016.